The new thing for this week was going to be a newly opened sushi restaurant but when we got there we were informed that due to two large take away orders we would have to wait for an hour and a half before our food would be ready. It was Friday night and we were both tired and eager to get home and just relax so we opted to go to our usual place instead. Once home we decided to serve the food on not new, but never before used, items. We used beautiful handpainted Japanese bowls for the miso soup (you can just make out the awesome pattern inside the bow in the pic) and granite platters for the sushi. It was so pretty and the food looked so delicious that I almost didn't want to ruin it by eating. These bowls and platters will definitely be used often from now on. It looks beautiful, Linda. We ate "japanese" this weekend, too ... a very small and perhaps-perceived-as-selfish nod to the issue currently being encountered on their soil. Somehow, given their wonderful cuisine, I'm pretty sure they would approve. Oh my gosh, how luxurious! I had a total sushi craving today, too, and tried to convince Tom that we should check out a new sushi place that opened here in town. But in the end we just went with tacos. And no fancy granite platters. 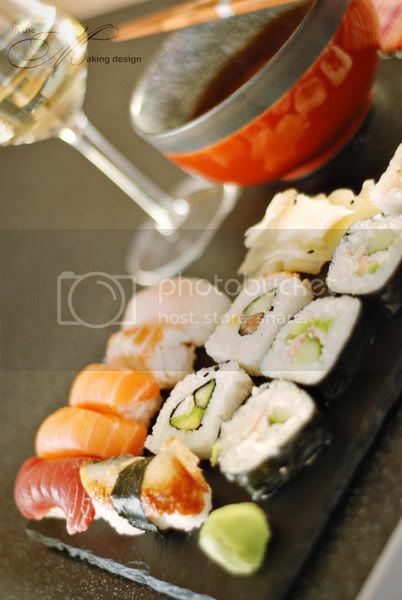 Love sushi and what a gorgeous photo! !